Beverly "Babe" Van Deurzen, 81, of Green Bay, departed this life peacefully at home on November 26, 2018. 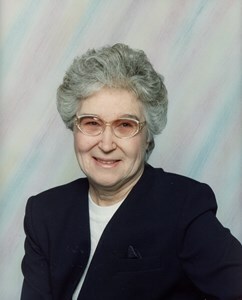 Beverly was born on April 1, 1937 in Green Bay, daughter of the late Harold and Leona (Mielke) Van Deurzen. She was a graduate of De Pere High School. In her younger years she was involved in 4H and was also a 4H leader. She worked in Data Entry for Broadway Automotive for 23 years and later was employed by Humana Insurance. She was a active member of the Republican Party and enjoyed working many campaigns. Beverly was a volunteer for the American Red Cross. She was extremely proud of celebrating 28 years of sobriety in the AA program. In her spare time she enjoyed knitting, sewing, and spending time with her great great nieces and nephew. She is survived by three sisters: Joann Van Deurzen, Nancy (Harley) Roffers, and June Francois. She also leaves four nieces: Laurie Robinson, Susie (Greg) Kobus, Christine Roffers, and Holly Roffers along with two nephews: Jesse Roffers and Zak (Brianna) Francois. Babe also leaves her great nieces: Jennifer Robinson and her children: Travis, Lydia, and Audrey, Sara Martinez and her children: Luciun and Lucius, and Candice Robinson and her children Jordan and Jasmine, along with two great nephews: Jacob Wendt and Logan Kobus. She is preceded in death by a brother-in-law: Carlton Francois Jr., niece, Robin Roffers, and nephew, Mark Roffers. Visitation will be held on Friday, November 30th from 4 PM - 7 PM at Newcomer - Green Bay Chapel, 340 S. Monroe Avenue, Green Bay. A memorial service will follow at 7 PM in the funeral home. Interment will be private. Add your memories to the guest book of Beverly Van Deurzen. I am sorry to hear of the loss of Babe. Your family is in my thoughts as you grieve your loss. I will fondly remember Babe in the times that I would see her on visits to my grandmother, Iris. I saw her last when we lost my Uncle Bob a few years back. She was so supportive and calming while we were grieving our loss. Wishing you the best during this time. Bev and my mother, Dolly Absher were friends for over 40 years. They met while working at Broadway Chevrolet and their friendship grew while sharing their deep interest in politics. It was because of Bev, that my mother was shown on the local news carrying a political picket sign several years ago. They spent a great deal of time on the phone solving the problems of their nieces, daughters and the state's.